There’s been some outrage expressed in recent days about the Jared Kushner Traveling Road Show that’s thus far visited China’s beltway metropolises of Beijing and Shanghai. Well-honed presentations in those cities offered affluent Chinese the chance to acquire U.S. immigration visas (green cards) for themselves and their families if they invested at least $500,000 in a real estate project in a New Jersey luxury apartment complex that’s been linked to the family of President Donald Trump's son-in-law, senior White House advisor Jared Kushner. 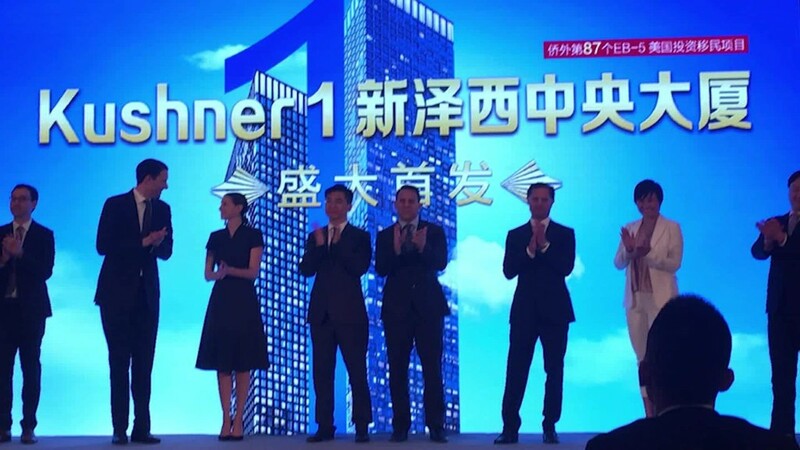 Even though the sales pitch (announced and organized by Qiaowai Group [侨外集团]—a high-profile Chinese agency specializing in overseas investments for Chinese nationals) was public and open to any interested parties—journalists were hassled at the Beijing gathering and barred admittance to the event in Shanghai. The treatment of reporters is one source of the current indignation. Another involves anger at the intimate political connections of the Americans involved, cast in the presentations as helping to secure visa approval. But there’s also the role of the Chinese investors themselves. It’s well known here that a substantial number of Chinese investors in projects overseas are looking to hide their money--and often themselves and their families. Some are corrupt, while others are just concerned about being seen as corrupt by a leadership on a crusade to put those who’ve engaged in graft behind bars. At the same time, other Chinese investors are clean and clearly after what they see as better opportunities for themselves and their loved ones abroad. Sometimes that’s better education, a cleaner environment, actual legal protection for their assets, or similar attributes many Chinese associate with being out of China and overseas. 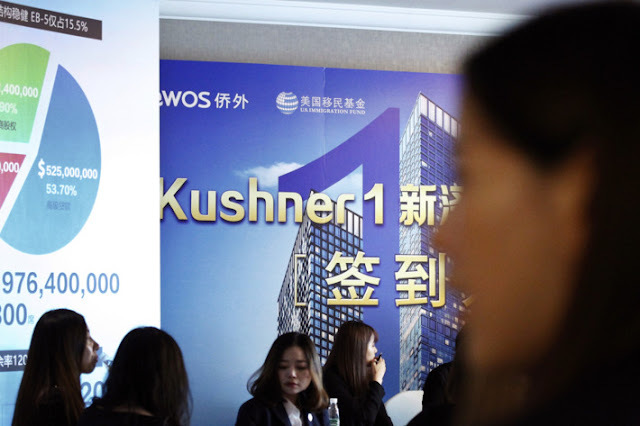 Whatever the specific motive—and apart from a passing interview with one of the Chinese attendees by the Washington Post, it’s not clear what sort of person was being pitched by the Kushners—those interested in investment programs are part of The New Wealthy here. For The New Wealthy, constructing a substantial nest egg has displaced building a stronger nation as their goal. It’s not the projected financial return that drives The New Wealthy in these investments, but the prospect of not needing to return—to China, that is. Green cards are a far more important goal to them than more greenbacks. That ambition to exit has a significant social impact in Local China. It’s reflected in the number of local properties here that are inhabited by seniors, as the latter wait for their own visas to visit and reside with their children and grandchildren abroad. In major cities, rentals in gated communities heretofore closed to all but the affluent have become accessible: Many people who have emigrated want to hold on to their property in China as a way of financing their residency overseas, but do not wish to actually live here any longer. So they rent to others--or more precisely, Others. Property management companies now complain about suddenly having to deal with more diverse residential compounds, with homeowners trying to coexist with Others who rent because they can, but lack a sense of civilized conduct. Local law enforcement is also unhappy and overstretched, as it's more frequently called in to break up disputes in these divided communities between long-time residents and Others. Social fabric gets rent by these new renters, making local officials uneasy. Emigration also means that schools here—from primary schools to universities--will never be transformed so long as the goal of so many parents is to have their children study overseas—an accomplishment that many mothers and fathers see as conveying status and class far more than any elite college in China. Private English classes have proliferated in second and third-tier cities for precisely that purpose of preparation. Special classes are often offered for seniors looking to join their family members who’ve already emigrated. Local teachers confide that parents increasingly measure the quality of their instruction in terms of getting their child set to excel overseas, not in preparation for the gaokao [高考], China’s high examination. Despite all the absurd adulation China's school system gets overseas, everyone here knows education has largely ceased to be a component of culture in China, and become yet another commodity to be bought from a foreign source. Less noticed is the local political component of the emigration issue--that is, what it means for public policy when the successful part of the public looks to leave. Those Chinese investors being pitched by Kushner and others are the very beneficiaries of a financial order based in large part on political connections and protection. More than a few are hard-working, self-sacrificing citizens; some are notably nothing of the sort. But instead of these investors looking to reinvest in China for the future, they’re gazing overseas to put their funds, their families, and their futures. The system that made it possible for so many of them to prosper is one they’re looking to abandon. That bothers more than a few government officials here, making it one of the more sensitive issues in political discussions. That’s in part because there are some cadres who are themselves looking to eventually reside abroad. But that caution in speaking out loud about the issue is mainly because growing numbers of local officials aren't happy about this outflow. They say privately that the cities they manage are being filled by migrants, while China’s most affluent and ambitious file to emigrate. Some cadres ask what they’re supposed to do locally to retain residents who show their appreciation for the extraordinary progress made in recent years in China by exiting. What’s the point of urban redevelopment and upgrading if so many seek satisfaction for themselves (and themselves alone) overseas, no matter what local government does to improve life here? There’s a need for a larger conversation in China about where this all is leading. These aren’t only local problems, but there may only be local solutions. While those are being sought, the Beltways can keep their bandits, near and abroad. The real challenges are for those who stay and struggle here at home. One unanswered question is whether it was the Chinese organizers who insisted on journalists being excluded, or their American partners. Another issue is who actually sought to attend the function to write about it: reporters, or their assistants, especially as at least one of the latter insists that she were made to delete her digital and visual recordings of the event? It’s not unknown for some foreign media outlets to send Chinese interns or assistants to events and then write up the notes they deliver under the accredited correspondent’s byline. Was that done in this instance, and for what reason—that it’s easier to hide a Chinese national in a setting that’s designed to appeal to them? There are many examples of countries in Asian that only one generation ago had net emigration of their elite. A couple of generations ago your post could even have been written about Europe. Many Europeans came to NA after the war. Not only from "looser" countries, but also from the "victor" countries. Perhaps this dilemma is new to mainland China, but it's not new to the world. Your point is valid to be sure. At the same time, the demographics of the generation that departed Europe were largely made up of the displaced and destitute. Chinese emigration to the US and elsewhere in the current period as been amply documented as the affluent. The difference is probably a crucial one. One sees emigration for all sorts of reasons, of course. Still, in China's case, those leaving are overwhelmingly those who have enjoyed financial success, and are now leveraging that into relocating elsewhere.